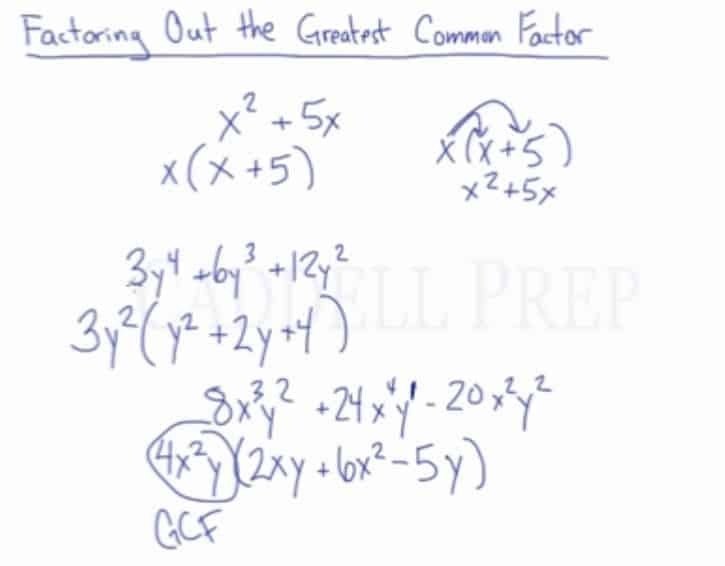 Learn how to factor out the greatest common factor (GCF). In this video, we are going to look at how to factor out the greatest common factor. Let’s go over factoring out the greatest common factor. We may need to factor this. The coefficients are and . The greatest common factor of these two is . But it will not help us. Since when we divided by , we have the same exact expression. But we can factor out the variable . Both terms can be divided by . When we factor, we divide out whatever the greatest common factor is. So when we find the greatest common factor, we divide it out in each term. We could see if we’re actually multiplying this. If we end up with the original expression. Let’s distribute into each term in the parenthesis. First, let’s figure out what the greatest common factor is of the coefficients. So, , , and . The biggest number that goes into all of them is . The greatest common factor of the variable is the term with the lowest exponent. So in this case, is the greatest common factor of the variable. So let’s take it out. Now, let’s divide each term by . What’s the greatest common factor of , and ? What about the smallest exponent? To recap, when factoring out the greatest common factor, we have to find the greatest common factor of each of the coefficients. And find what variables are in common with the smallest exponent. And divide each term by the greatest common factor. We’ll have a monomial and polynomial. The monomial being the greatest common factor or GCF.